Is it possible to Toggle off artificial lights in a larger scene partly ? I guess, the areas near glazing which is getting sunlight may avoid artificial light as it blows off the material textures ....while sun-light render them very nicely and also helps in rendering time . At the same time the lights in the deeper portion of the hall (away from sunlight range) need to be on to give illumination and proper lighting effects . And need to render evening/night scenes also ....so cant adjust these it all the time in a tight timeline project . Any advise or workaround shall be helpful please . Another query is for batch rendering select scenes only . Can the batch scrips be made for selected scenes and put in que for overnight rendering for final output . If you are on Windows you can use the Generate All feature which batch creates scenes which can be queued up later. What I don't know however, is whether Generate all (>Extensions>Podium Extras>Generate all) uses the new per-scene settings configuration. It used to be the case that every scene you created with this feature used the same render settings, which meant you can't batch render interiors and exteriors at the same time - unless they used the same preset. Podium 2.6 allows you to save render configurations per scene, so it ought to overcome this limitation. However because most of my work is done on a Mac, I haven't tested it on the Windows machine yet. Can you pls guide how to select and toggle only few instances of a light fixture which is used in various other locations ? Also can these toggle.settings be scene specific? Like different times of day may need different lighting selection schemes. And I don't want to use Generate-All for render . As there are several scenes which are not required for rendering at that time ...or some Ortho and plan scenes are just set up to examine modelling progress or placing components. Unfortunately because of the way SketchUp instancing works, the Light Fixture Outliner doesn't help much with this. 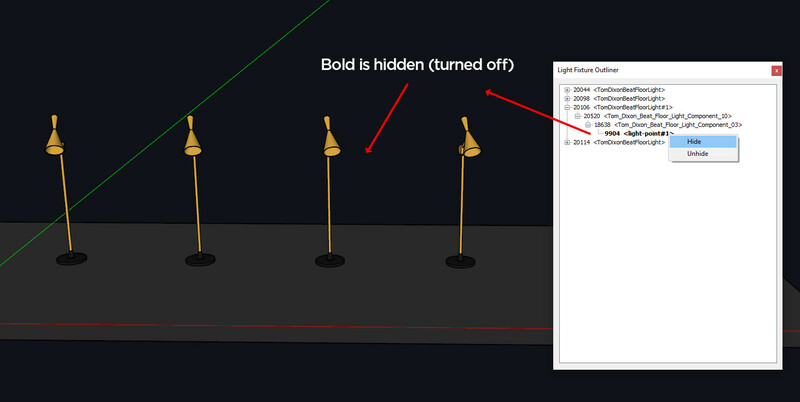 You have to drill into the component hierarchy until you get to the component that actually contains the Podium light. Then use the "make unique" command to disconnect it from the other instances. So for this lamp the Podium light is inside the cone of the lamp. Click into the lamp component, right click the cone instance in SketchUp and choose make unique. Then you can toggle the point light on and off individually, or adjust the light intensity without affecting the rest of the instances. Note -- Some of the light fixtures don't have embedded components and you can just right click the light fixture in SketchUp and make it unique. But usually you have to drill down a few levels. Oh also, Generate All does let you choose the scenes you want to generate. So you can just have it ignore the orthos and everything you don't need to render. Shall try as per above method. Justin's info. is correct in regards to instanced light fixtures. But if the light fixtures are not instanced....for example, you have a variety of independent point lights or a variety of light fixtures, you can select a group of light fixtures or point lights using Light Fixture Outliner and context click the highlighted light fixtures or point lights and choose Hide All. (Different from just "Hide"). That will turn off the point lights selected. That's part of the beauty of Light Fixture Outliner. 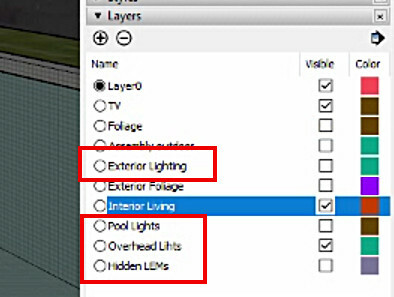 It was made so you don't have to find point lights/ spot lights through SketchUp's Outliner (very slow if you have many components) and so you can easily "turn off" selected lights. Also, you do not have to drill down to the actual point light. You can simply pick the light fixture's name. And you can turn back on the light fixture's point lights by selecting, context click and Unhide. But you are stuck to picking individual point lights, if the light fixtures are instanced. Now, if you save the model with the point lights turned off, they will stay off when you open the model again. One problem is just like SketchUp's Outliner, you need to hold the shift key (in Windows) and select a group of light fixtures or point lights to highlight the lights you want to turn off. But using the Shift key does not always work....this is the same problem I have in Outliner. Also, Generate All was created for exactly what you are needing. You can select what scenes that you want rendered. What will happen is script files will be created for each scene you selected to a specific folder of your choice. If you want to batch render, the scripts over night, open OOPR/ Render Manager and use Add File to add a number of scripts. You can even use Add Folder if all the scripts are in the same folder. I think, one should make component Unique near window...before creating more instances for that zone. Only problem shall be any material or shape changes need to done again in that component cluster for sake of design continuity. And then this ( not 'toggle') info is saved with model... Not per scene ? Generally there are day and night scene in same model. Even different time of day ...or using HDRs can alter the need to switching on or off these lights . That's a good point about having day and night scenes in the same model. So you might want the point lights off in the day scene. If you toggle point lights off and save the model, the point lights will be off next time you open the model. Why not create a different model for night and day? You could still use Generate and save the scripts to the same folder and then over night batch render them. The problem with different model ( or file) for various scene setting doesn't work (for a design practice )...where the changes keep happening as per project requirements at various stages ....( At times we lose count ). May be very counter productive to keep updating model. Podium is preferred ..so that we can save time and quickly visualise design changes inhouse .... By the project architect themselves in fast track projects. It is really helpful , while we are trying to learn and establish the best practices and correct/ quickest workflow for the scale and nature of projects we do regularly. You can actually use layers for this pretty easily! Since layer visibility is something that is saved with SketchUp scenes, Generate will recognize it without a problem. So for your "day scene" most of the light layers might be turned off, then in the night scene the layers could be on. Even though I was rendering with ProWalker there, it would work with Podium / Generate. Does that means only the light( buried inside one..😉 ) need to be on different layer ? As the container need to be visible . Yeah you would have to do that manually. And if they are instances you would need to make them unique, as explained above. Podium simply builds on SketchUp tools and techniques. If you structure your models with components and groups, and control what you see using layers and views and hidden geometry, you can make your workflow much more efficient. If for example you have a room with a series of identical lights which are zoned from the window to the back of the room, you can make the components unique and copy them and you can control the visibility of light sources with layers or hidden geometry, configured by scenes. Using scenes and layers is also a great way to switch between day and night views. By having Podium v2.6 store render configuration for each scene separately, it makes it easier again. Thanks for all the help and prompt responses. Shall keep these pointers in mind .